Encontre seu guia perto da Piazza della Signoria e vá até a movimentada praça do Duomo. No horário de pico, as linhas de entrada para o Duomo de Florença podem levar mais de duas horas, mas você terá acesso prioritário com seu ingresso sem fila e siga direto para dentro. Ouça a fascinante história por trás da cúpula antes de começar a subir seus 463 degraus. Espere uma subida íngreme, já que a viagem pode levar aproximadamente 45 minutos. Ao subir, admire os afrescos de artistas renascentistas como Zuccari e Vasari nas duas conchas da cúpula. Então, chegue ao topo e aproveite a recompensa por todo o seu trabalho duro. Passeie pela varanda da cúpula para aproveitar a vista de 360 graus de Florença e as colinas da Toscana se estendem abaixo. 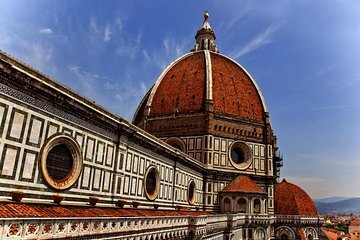 Seu guia fornecerá informações detalhadas sobre Filippo Brunelleschi, o arquiteto por trás dessa obra-prima da Renascença. Antes de se despedir do seu guia, receba ingressos para o museu para continuar explorando de forma independente. We booked this tour very last minute because the dome tickets were sold out. We were so happy we did it! Honestly, it was our guide, Caterina, who made this an amazing tour. She was very knowledgeable and provided so much history to us. Caterina was funny and very pleasant and she went out of her way to take care of our group of 10. It was quite busy climbing up and down the dome, but you could tell immediately that we had the best guide. She stopped others from interrupting or cutting in between our group. The climb wasn't that bad and the view on the top is so worth it. If you can request for Caterina and you won't be disappointed. As with all of my tours through Viator, I found this one to be excellent. Francesca was very knowledgeable, friendly and a great guide. It may be not suitable for those with bad legs on a tour that goes up about 400 to 500 stairs of Duomo. Because the staircase width is narrow, because only one person can walk, we can not pass, so I think that it is necessary to understand and participate in the pleasant tour. In the guide she was a very friendly guide and we had two boys with teenagers, but they also made a guide to make them understand better. As I could not hear the explanation of the paintings on the ceiling when I was a lot of people, I could also listen to it later. We ate gelato at a recommended shop, it was very delicious. Great way to see the Duomo without all the lines. The group was a bit large for my liking. We had to wear the headphones so we could hear the guide. They weren't the best and many times you could not hear what she was talking about. The guide was friendly and knowledgeable. Our guide for this tour was Francesca. She was very good and very thorough. The climb up all those steps was something. It is amazing how it was constructed. I was impressed with Francesca, but I was not very impressed with the Duomo. The best part was the gelato at the end. That is just an individual preference. I wouldn't have known that until I had done the tour, it is no one's fault, just one of those things. Nice tour with an informative guide. Seemed a bit expensive, but skipping lines is a must in Florence. I bought the ticket without really reading the description, and as it occurred it was a guided tour of the cathedral. I have to say, it was the best surprise! Our guide knew all the secrets of the cathedral. He took us to a balcony that is only accessible with the group, which was the most beautiful place. The Dome Climb is not for the weak of heart, because you will be in a narrow staircase, so very high above the ground. The tour is about 3 hours total. This was very nice to see all of Florence once you made it up to the top through the long narrow staircase. Be prepared to climb up because it is a hike! This was the best of the five tours I booked through Viator! Our guide Christina was very knowledeable about the Duomo and the surrounding area. She was good at making sure that all members of the tour were accounted for. We were not able to complete the entire climb to the Dome, but she gave us excellent instructions on where to meet her to complete the tour. Unfortunately, it started raining, so we didn't go back to complete it-but that wasn't the tour operator's fault. I would highly recommend this tour!